Background: Spinal cord injury (SCI) requires special healthcare and rehabilitation. Objective: The article describes and qualitatively assesses Arabic websites relevant to patient information about SCI. Materials and Methods: In March 2018, Google was searched using the Arabic translation of SCI. The first 100 results were assessed against inclusion and exclusion criteria. The following data were collected: Website name, URL, its category, SCI topic, and whether Health on the Net (HON) code was included in this study. In addition, the quality of them was assessed using the DISCERN tool. Results: A total of 13 websites were included in this study. Only two websites included HON code. Majority of them (>10) included information about the definition of SCI, its causes and its complications. Eight of them mentioned available treatment options. Most of them were blogs. Two of them were from hospital that is advertising for their SCI healthcare. According to the quality level assessment, 30.8% were of poor quality, 23.7% were of fair quality, 23.7% were of good quality, and 23.7% were of excellent quality. Conclusion: This study shows that the current available Arabic websites with SCI are insufficient. Moreover, their quality needs to be improved. In addition, there is no available governmental or institutional website with patient information about the topic. Governments, universities, and associations are encouraged to fill this gap to prevent probable patient risks that may arise from it. Some recommendations regarding quality improvement are provided. Arabic is the sixth most spoken language in the world with >420 million, mainly in the Middle East and North Africa (MENA) region. There are abundant resources in English providing information about SCI. However, the literature is lacking an assessment pertaining to qualitative assessment of websites about SCI in Arabic. This article aims to summarize the characteristics of Arabic websites relevant to patient information about SCI and also provides qualitative assessment of them. In March 2018, the Arabic translation of SCI ( ) was used to locate top Arabic websites with information about SCI. The search was conducted on the Google search engine (http://www.google.com) since it is the most used search engine in the MENA region., The search history and cookies were cleared before the search to avoid potential impact on the search results. The first 100 results ( first 5 pages) were examined. Exclusion criteria included the following: research article, dictionary, videos, social network pages, news, and encyclopedia. The following data were collected: Name of the website, its URL, topic and whether containing Health on the Net (HON) code., The websites were examined if containing any information pertaining to one of the following topics: definition of the SCI, causes of the injury, complications following it, health needs and rehabilitation and treatments options. If the website contained any of these topics, it got a score of one. If the specific subtopic is not mentioned, it got a score of zero. In addition, included websites were categorized as governmental, association, foundation, hospital, institution, or blog. Moreover, the quality of the websites were assessed using the DISCERN tool., The DISCERN tool rates the quality based on 16 questions. The answer to the question could be no (1 score), partial (2, 3, or 4 scores) or yes (5 scores). Each website could attain a maximum of 80 scores. The DISCERN tool has been validated and used in may previous publications., The quality of the websites was categorized into the following: very poor quality (<27), poor quality (27 < 39), fair quality (39 < 51), good quality (51 < 62), and excellent quality (>62). Descriptive statistical analysis including the mean and standard deviation (SD) of the DISCERN scores were performed. After performing the search and judging the results according to the inclusion and exclusion criteria, 13 websites were included in this study [Table 1]. 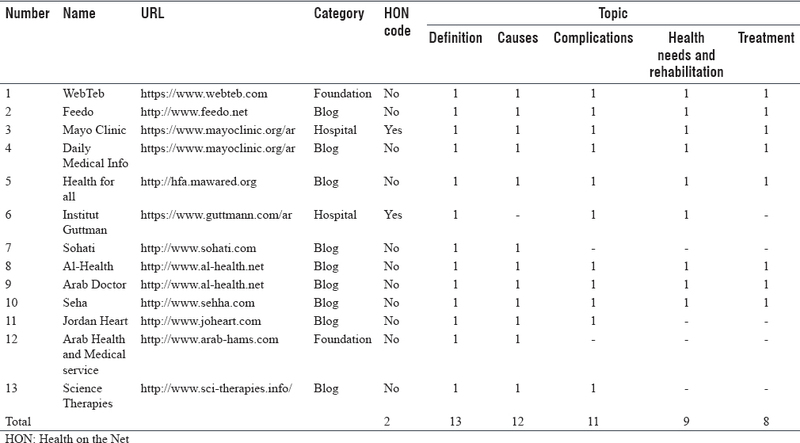 Two websites were foundations websites, two websites were hospital websites, and nine websites were blogs. Only two are using the HON code at the time of the search. According to the topic reporting: all included websites reported definition of SCI, 12 websites included the causes, 11 websites included complications, 9 websites reported about health needs and rehabilitation, and only 8 websites wrote about the treatment choices. According to the quality assessment, the mean DISCERN score was 48.85 (SD 115.75) [Table 2]. Moreover, according to the quality level assessment, 30.8% were of poor quality, 23.7% were of fair quality, 23.7% were of good quality, and 23.7% were of excellent quality. None of the included websites was of very poor quality. SCI injury requires close follow-up of the patients to ensure receiving the accurate answer to the health information about their case. This could be affected by staff shortage, low healthcare resources or the limited patient-physician interaction time. This article examined the Arabic websites about SCI and assessed their quality. It is clear that there is deficit in the availability of SCI information in Arabic since only 13 websites out of 100 were included in this study. Moreover, most websites have not used the HON code which affects the credibility of their information. In addition, no governmental, institutional, or association websites have been included in this study. Thus, governments, institutions, and SCI association are encouraged to do more efforts to provide the patients with accurate, updated, and balanced information about SCI In addition, some of the included websites lack information about treatment options for patient with SCI. This information gap may lead patients to be exploited via pursuing unapproved treatments or treatments with doubtful benefits. Furthermore, according to the DISCERN quality assessment, there are several factors that may improve the quality of Arabic websites about SCI. First, websites need to cite updated references and to provide further reading options to the readers. Second, they need to insist on mentioning the lack of definite treatment currently that could restore the normal functional architecture of the spinal cord. This will help guide readers not to follow advertisements that could propagate unapproved treatments. Third, they should provide elaboration about the options that could alleviate the burden of the post-injury secondary complications. Fourth, information targeting patient's caregivers should be emphasized. This is the first article to examine Arabic websites with SCI information. The current websites need improvements and further high-quality websites are needed. Hou S, Rabchevsky AG. Autonomic consequences of spinal cord injury. Compr Physiol 2014;4:1419-53. Sezer N, Akkuş S, Uğurlu FG. Chronic complications of spinal cord injury. World J Orthop 2015;6:24-33. Nas K, Yazmalar L, Şah V, Aydın A, Öneş K. Rehabilitation of spinal cord injuries. World J Orthop 2015;6:8-16. Emerich L, Parsons KC, Stein A. Competent care for persons with spinal cord injury and dysfunction in acute inpatient rehabilitation. Top Spinal Cord Inj Rehabil 2012;18:149-66. Mwebaza I, Katende G, Groves S, Nankumbi J. Nurses' knowledge, practices, and barriers in care of patients with pressure ulcers in a Ugandan teaching hospital. Nurs Res Pract 2014;2014:973602. Knox K, Rohatinsky N, Rogers M, Goodridge D, Linassi G. Access to traumatic spinal cord injury care in Saskatchewan, Canada: A qualitative study on community healthcare provider perspectives. Can J Disabil Stud 2014;3:83-103. Diaz JA, Griffith RA, Ng JJ, Reinert SE, Friedmann PD, Moulton AW, et al. Patients' use of the internet for medical information. J Gen Intern Med 2002;17:180-5. Tonsaker T, Bartlett G, Trpkov C. Health information on the internet: Gold mine or minefield? Can Fam Physician 2014;60:407-8. Tan SS, Goonawardene N. Internet health information seeking and the patient-physician relationship: A systematic review. J Med Internet Res 2017;19:e9. Massicotte A. When to trust health information posted on the internet. Can Pharm J (Ott) 2015;148:61-3. Fox S. What Ails America? Dr. Google can tell you. Pew Research Center; 2013. Available from: http://www.pewresearch.org/fact-tank/2013/12/17/what-ails-america-dr-google-can-tell-you/. [Last accessed on 2018 Mar 18]. World Health Organization. The Health Internet. WHO. Available from: http://www.who.int/ehealth/programmes/governance/en/. [Last accessed on 2018 Mar 18]. White R, Horvitz E. From web search to healthcare utilization: Privacy-sensitive studies from mobile data. J Am Med Inform Assoc 2013;20:61-8. Huesch MD. Privacy protection during internet search for health-related information – Reply. JAMA Intern Med 2014;174:477. EL. Top Arabic Search Engines. Extra Digital Ltd. Available from: https://www.extradigital.co.uk/articles/seo/arabic-search-engines.html. [Last accessed on 2018 Mar 18]. Middle East Search Engines – What you need to know; 2013. Available from: http://www.istizada.com/blog/middle-east-search-engines/. [Last accessed on 2018 Mar 18]. Health on the Net (HON): Health on the Net Code of Conduct (HONcode). Available from: https://www.hon.ch/HONcode/. [Last accessed on 2018 Mar 18]. Boyer C, Selby M, Scherrer JR, Appel RD. The health on the net code of conduct for medical and health websites. Comput Biol Med 1998;28:603-10. Rees CE, Ford JE, Sheard CE. 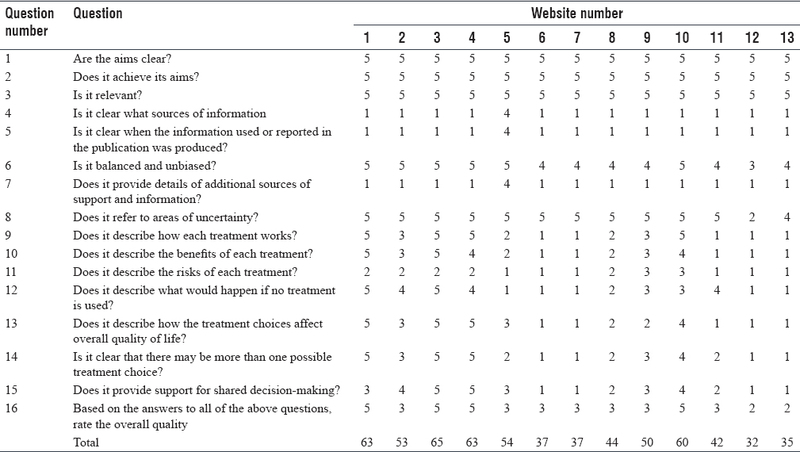 Evaluating the reliability of DISCERN: A tool for assessing the quality of written patient information on treatment choices. Patient Educ Couns 2002;47:273-5. DISCERN-Welcome to DISCERN. Available from: http://www.discern.org.uk/index.php [Last accessed on 2018 Mar 18]. Batchelor JM, Ohya Y. Use of the DISCERN instrument by patients and health professionals to assess information resources on treatments for asthma and atopic dermatitis. Allergol Int 2009;58:141-5. Cerminara C, Santarone ME, Casarelli L, Curatolo P, El Malhany N. Use of the DISCERN tool for evaluating web searches in childhood epilepsy. Epilepsy Behav 2014;41:119-21. San Giorgi MR, de Groot OS, Dikkers FG. Quality and readability assessment of websites related to recurrent respiratory papillomatosis. Laryngoscope 2017;127:2293-7.